Everything Rachael Ray: Booksingings Everywhere! 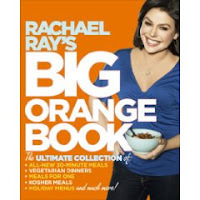 Holy cow, there have been so many newspaper articles and blog posts about Rachael Ray's booksigning appearances for the Big Orange Book that I can't possibly write posts about all of them! So, I thought I'd do one summary post so you can check out the different perspectives. It cracks me up that you can soooo tell whether the reporter likes Rachael or not just by reading the tone they use to describe the event. It sounds like Rach is really inspiring some kids out there. Mom of 2 Boys of Weighing in on Life attended a booksigning in Ohio. Grayce's Momma had a positive experience in Ohio. Heather of Highly Caffeinated tells a good story about her trip to see Rach. Mamaladybug of Adventures of Supermommy and Flying Baby was left feeling disappointed by her booksigning experience. I am so sad she did not make it out to Calif this tour... Maybe next book.